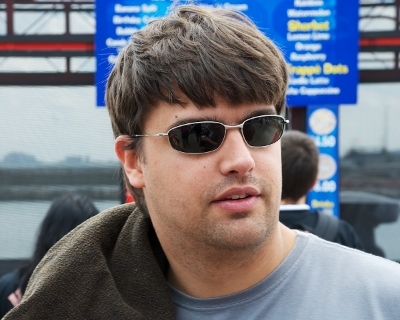 Today I have the pleasure and honor to welcome Rafael Dohms the 2nd PHP ninja turtle (the other one being of course Michelangelo van Dam) on 7PHP, after his first which dates back to April 2012. Rafael has recently come up with an awesome initiative (some days back): the elePHPant family will soon witness the arrival of a new family member – The Black elePHPant. 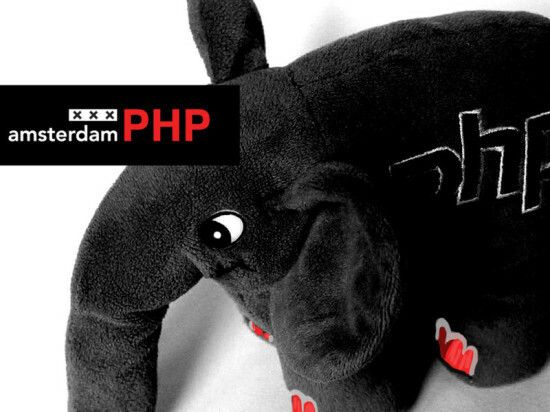 This will thus expand the magical color-combination of the PHP mascot, aka the elePHPant, with a new branded color – that of the black & red color of the Amsterdam PHP Usergroup. Do you want to know the whys & hows behind this initiative and the mystery behind the dark black elePHPant? Read on! 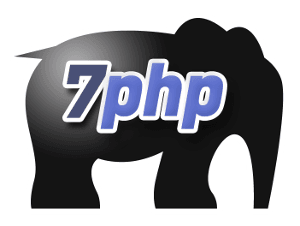 >> Hi Rafael, it’s been long since you featured on 7PHP. That goes way back in April 2012. So update us a bit about yourself, where you are currently, what you are doing and what are you planning – project/community wise. It has been a long time indeed. A lot happened since then, including me having to take a bit of time off from everything to deal with some personal issues. But now we are back on track, I’m currently working at a company called Symbid which is diving into the new financial market of crowd and equity funding, its a interesting challenge. On the side of that AmsterdamPHP is still in full swing and i’m also giving a side project called Podtrack (podtrack.me) some on and off attention. >> How does the PHP ecosystem looks like in Amsterdam? Is there a lot of prospects in terms of PHP work and passionate PHP guys? 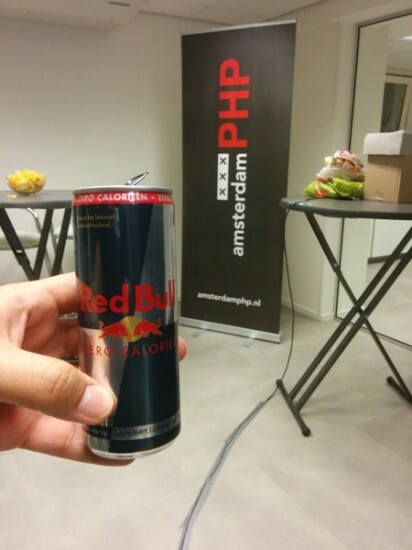 PHP is booming in Amsterdam. Every month we find or are found by new companies who want to get involved with AmsterdamPHP and who are of course, looking for new developers. 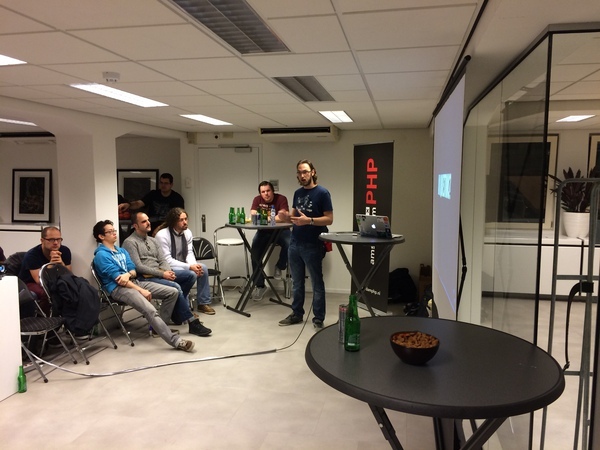 We have a great and wonderful set of passionate guys, and more and more have stepped up to help and get involved with AmsterdamPHP. When you got names like Erika Heidi, Frank de Jongue and all our active enablers, you can’t really go wrong. We even have Ross Tuck hanging around along with Shawn McCool which add so much to our knowledge base. AmsterdamPHP has been a wild ride, i’m no newbie to the UG scene, but this one has grown further and faster then any before, powered by this unique combination of technological hotspot and social developers that Amsterdam has. Back in 2012 me and Frank van de Brink created the group to cover the gap between PHPBenelux meetings, and from that moment till now it never held back, we visit different companies every month and they just keep showing up. The idea of the group has many fronts, the main objective is to share knowledge and empower the community, but in the process we also connect developers and companies, meaning everyone has the right information to decide if they are working where they would like or if they have the developers they need. One great side effect of that is we also form various bonds between developers, effectively making friends, not just peers. Working on creating those friendships, we launched a new project this year, with the help of Ross Tuck’s wife, Aisha, we are hosting game nights. We hang out in a backroom of a pub and play board games all night, its a lot of fun, i recommend it to all UG leaders. Games like Munchkin and CAH are just awesome. >> You have just started a kickstarter some days back and it’s already (30th Nov 2014) at an amazing €14,351 – with the pledged goal at €15,000. How and why did you come up with this idea? What message are you diffusing with this awesome initiative? It has been a long standing dream of many PHP UG’s i guess, to have their own PHP ElePHPant. We are no exception. After seeing php[arch] and PHPWomen successfully launch kickstarters we decided we could finally do this. Me and the other enablers (Pascal, Jakub and Jeroen along with Frank who has since stepped down) got to talking and trying to figure out if this was doable. Black and Red are the colors of Amsterdam and we wanted to see a Black elePHPant, one of the last colors not yet done. More then that we really love the work AmsterdamPHP has accomplished, the community we have built and we want to inspire all our members and even the rest of the community to feel proud of this and to be motivated to be more, to be awesome. We hope having this mascot at home will bring up those feelings in everyone. >> Now since the goal will surely be met anytime soon, I consider it already a hit. What is your feeling? The Community has responded amazingly to your call – what’s your message or comment to The Community. The response has been amazing. We were expecting to be successful for sure, but to be so close to the goal in less then 5 days is just amazing. The comments and reactions we have seen so far are humbling and completely awesome. This is still not a done deal, we still need everyone to come out and secure their little fellow, the 15K goal will be enough to fabricate them, but we need to go a bit over to cover shipping costs and raise some funds for the UG which also has its running costs. Its worth noting that our UG is a not for profit organization on paper, so basically everything that goes into it, will be invested into our actions and events. All i can say is thank you to everyone who pledged, shared and cheered us on, its an amazing ride and we are all freaking out in our chat channel. We knew this would be no small task, and yep, its a huge one. We have been crunching numbers, making calls, freaking out over how cool they are and cycling through giving up and restarting again for over 3 months in preparation. We have gotten advice from my own company on crowdfunding and talked to previous campaigns like i mentioned above. We have most of the facts, but things like shipping and estimating how many people will pledge is extremely hard. There is still a lot of guess work here. >> What are the next steps after the funding is successful and how easy or difficult will those be? Once we hit funding we start working out the manufacturing step. This is still a lot of work, we need to order 900 to make this happen, once we work over the costs we then need to wait for delivery and then comes the real hard work of shipping them to their families. This means having a bunch of people help out with boxing and labeling and all that, and working out the final shipping costs. This shipping is still a worry, we cannot be fully certain we have covered the costs for all countries that ordered. Right now we have already sold over 415 elePHPants, ideally we hit 900, that should ensure we have no “unknown” costs. This means not stopping at 15K, but pushing ahead and trying to get as many people in as possible. >> Also, I saw that some people found the $15,000 target high. Could you explain to them the why’s of this target? 15K is actually pretty low for this campaign. We do not have any funds to invest into this, so we really need everyone’s help and sponsors to get it sorted. The goal will cover all the manufacturing and delivery, but Kickstarter also includes all the shipping costs in that goal, so a part of it still needs to be covered. We are selling elePHPants at near cost, with a bit of a margin to cover the “extras” this includes dealing with Dutch Taxes, filing paperwork, shipping and handling, as well as lots of human power for the packing stage. Since custom elePHPants require a minimum order of 900, that’s our goal. If we could make only 400, then yeah we would have a lot lower goal. We are not aiming at any profit here, but hopefully by the end we manage to get some reserve to cover our monthly expenses and maybe do something cool next year for the UG and community in general. >> Since the original mascot is attributed to Vincent Pontier, is there any kind of agreement or notification that you need to engage with Vincent prior to going on your own branded elePHPant? Yes, step number one for us was talking to Vincent and his partners at Open Goodies. 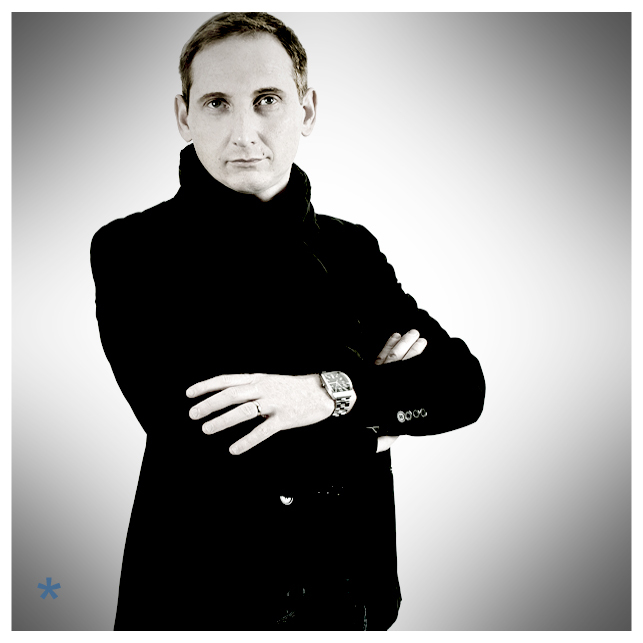 And they are amazing people, he gave us all information, cheered us on and made the preview you see right now on the homepage of the project. When I saw this image i knew we had to make it, at that moment i knew we had to go ahead and get this done, they look so amazing, i’m totally in love with them. Production of the elePHPants happens through Open Goodies, its with them that we negotiate, plan and order all of this and they are very supportive. Vincent loves his creation and is very excited to support any actions around them. If you want to do something like this, start with him. >> Was it something easy for you or you had doubts, but just wanted to do it anyway? >> Would you recommend any user group to start such a campaign? If you got the drive, the people and the time, sure! The more elePHPants the better, but its not by far easy. Dealing with all the fees, government regulations, import/export stuff can be very complex depending on your country. We also found shipping from NL to be very expensive, so we went looking for specialized companies that could offer better costs. >> Last but not the least, do you have any other message to convey? We are all just waiting to be awesome, so BE AWESOME. My goal in life is to open ways for people to be as awesome as they can be. If this adventure we have embarked on sparks more people to give their insane ideas a try, its a win in my book. Other then that i would like to thank, first of all my co-organizers for all the work and passion we have put into this. And the community for backing us, and helping this on its way to be a reality.